A 2 day package to truly immerse yourself. Warm up in the cedar sauna and prepare your body for a relaxing soak in bath of freshly drawn seaweed from the pristine shores of Valentia Island, on the edge of Europe. The natural oils are of benefit to both mind and body. Arrive and enjoy a relaxing evening on Valentia Island. Stay at Atlantic Villa, in our Superior Sea View room. 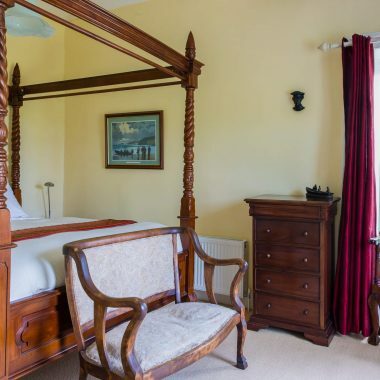 This room has a four poster king size bed, sea views and a stand alone Victorian clawfoot bath for your enjoyment. Savour the breakfast of your choice. Spend the morning and early afternoon touring the breathtaking parts of Valentia Island “as far west as it gets” by walking, cycling or driving. Perhaps stop in for a coffee or enjoy lunch. Then around 3pm, return to Atlantic Villa to enjoy the Sauna and Seaweed bath experience. Afterwards feel free to sip herbal tea or coffee in the library as your mind and body still feel the natural benefits of the seaweed. Enjoy a second evening in the superior sea view room. *Price includes 2 nights B&B in our Superior Sea View Room for 2 guests, use of the in-house sauna, and freshly prepared seaweed bath on one day of your stay.